Located in the southwest corner of San Francisco in a safe residential neighborhood, the Ocean Park is one block from the San Francisco Zoo and the dunes of Ocean Beach — where hang gliders and surfers cruise the air and water. Bicyclists, joggers, and pedestrians enjoy the landscaped pathway along the ocean to Golden Gate Park and the Cliff House. Devil's Teeth Bakery on Noriega rewards a twenty-minute walk along this path. 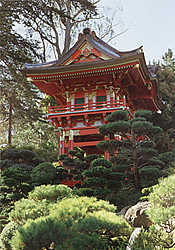 Our most famous local attraction, Golden Gate Park features the spectacular Academy of Science; theexquisite Japanese Tea Garden; and de Young Museum, with its panoramic views of SF. 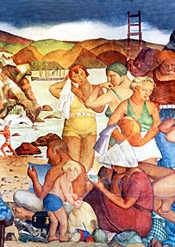 Nearby are the historic WPA murals of the nationally landmarked Beach Chalet. Dogs play in the dunes high above the Pacific at Fort Funston, amid paved trails with glorious views of the western end of our city overlooking the Golden Gate Park, the Marin Headlands and Golden Gate Bridge. Fine shopping at the Stonestown Galleria and dining at a number of excellent restaurants are just a few minutes by car. Several small cafes are within easy walking distance. We provide an extensive list of recommendations. A twenty minute drive to the airport or downtown, we have convenient public transportation at our door, direct to downtown attractions.